Beautiful. That's the word that most appropriately sums up I Am Love – the film is a portrait of beautiful people in beautiful surroundings, and it has been beautifully made. The story is the stuff of old-fashioned romantic melodrama, but it's the style rather than the content that catches the eye here. Luca Guadagnino's film is unashamedly grandiose in its cinematic approach, with the elegant cinematography and strident musical accompaniment creating a visual and aural feast for cinephiles to enjoy. I Am Love references directors such as Michael Powell, Max Ophuls, Lucino Visconti and Alfred Hitchcock among others as it sweeps us forward with its vivid cinematic brio, but there are times when the film's script struggles to keep pace with the direction. At these uneven moments, Guadagnino is fortunate to have Tilda Swinton on hand, as she provides I Am Love with a rock-solid centre. Giving yet another mesmerising display, Swinton plays Emma, the Russian-born wife of an Italian businessman. She has married into the Recchi family, a powerful dynasty that has made its fortune in textiles, and the film opens on a night of celebration, with the clan convening to celebrate the birthday of their dying patriarch, Edoardo (Gabriele Ferzetti). He chooses this night to announce his successor, although his decision to hand the reins of power to both his son Tancredi (Pippo Delbono) and his grandson Edoardo Jr. (Flavio Parenti) raises eyebrows. "It will take two men to replace me," he announces, although the surprising twist has clearly injected a sense of tension into the hitherto convivial atmosphere. Guadagnino will occasionally return to the affairs of the Recchi business empire throughout I Am Love, but to tell the truth, it is not particularly interesting. The film is far more engaging when it is dealing with the affairs of the heart, particularly those experienced by Emma, who is much taken by her son's friend Antonio (Edoardo Gabbriellini), a working-class chef. Surprisingly, her first scene of rapture occurs not in a sexual context, but in a sensual one, with Emma being enchanted by the taste of the food Antonio has prepared in his restaurant. The rest of her dining companions fade into shadows and the camera moves in close as Emma, illuminated by a spotlight, savours every sumptuous bite of her meal. It's a transcendent moment, and a wonderful example of the director's ability to convey emotions and sensations through his imaginative camerawork, editing and musical choices. This ability comes into play again later, when Emma and Antonio finally consummate their passion in a sun-drenched field, although it's really the lead actress who sells her character's sexual reawakening. 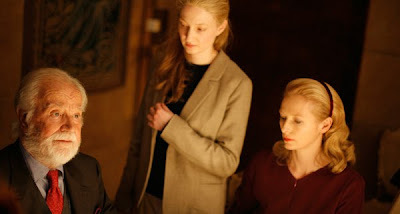 I Am Love has been a passion project for Swinton, who has developed the film with the director over the past decade, and she is fully invested in the part. When Emma begins her affair she appears as a woman revitalised, loosening her chignon and becoming freer in her actions, and Swinton finds stunning moments of honest emotion in her portrayal. After she first makes love with Antonio, Guadagnino cuts straight to the aftermath, with Emma rushing home and into her bathroom. As she cups her hand over her mouth, Swinton's face is aglow with mixture of disbelief, desire, fear and wonderment – it's a superb piece of acting. At its best, I Am Love hits impressive emotional peaks, with editor Walter Fasano cutting inventively and effectively to the marvellous soundtrack, consisting of pieces written by the composer John Adams. Too often, however, the film is stalled by its subplots, and I was exasperated by Guadagnino's decision to sit in on a dull board meeting involving the fate to the Recchi organisation while passions were raging at home. I Am Love is unbalanced and often feels rather thin, and it will undoubtedly be accused of being little more than style over substance, but style is breathtaking and when the obviously talented Guadagnino finds the right note, both the style and substance meld beautifully. This is never more apparent than in the film's breathtaking finale, during which he choreographs the action to the bombastic score, allows the music to drown out the dialogue, and lets his characters' glances and expressions – each pregnant with meaning – tell the story. If Guadagnino had unleashed the full force of his operatic reach earlier and more frequently, I Am Love might have achieved the overwhelming emotional impact it is obviously striving for.